Believe it or not, even in 2018, I still hear from business owners and B2B companies who think that a blog has no place on their website. They may think the effort it takes isn’t worth the investment. Or, they (mistakenly) believe that blogs are only for personal use or showcasing opinions. What they fail to realize is how many ways a blog helps turn a website into a useful marketing tool. Blogs are an essential component of any inbound or content marketing effort. Still not convinced? Well here are seven reasons that demonstrate why a blog is essential for your business website. Reason #1. Get found more easily. One of the main reasons any business-focused website should consider a blog is for the search engine optimization (SEO) value it offers. Google and other search engines place a high value on website pages with content that is frequently updated and of high quality. Blog articles help improve the amount of time people spend on your website, increase the number of pages they share or bookmark, and make it easier to include the sort of keyword phrases visitors might actually use in search engines. These are all factors that affect your website’s rank in search results. Blogs also make it easier to get organic backlinks to your website, as visitors are more inclined to share blog articles or educational materials than other types of pages (especially purely promotional product pages). Reason #2. Gain credibility as an expert. Sharing your industry knowledge, experience and expertise in relevant, well-crafted blog posts shows your potential customers that you know what you’re talking about. Customers are more likely to engage with businesses they see as experts in their field. You can use a blog to go into detail with useful tips about your products, answer customer questions, and provide advice about choosing between various options. You can also use a blog to generate interest from people who may not yet be considering a purchase. By providing education and advice that is useful in nature instead of focused purely on selling or promoting a product, you can help establish an audience for your expertise. In addition, website visitors are more likely to share articles that provide useful business information with their contacts on social networks. That will grow your reputation as an expert, and also result in more traffic to your website. Reason #3. Tell your story in another way. Storytelling is an engaging and effective way to interact with your potential customers. Tell them more about why you do what you do. What makes you passionate about what your company does? How did your company get started? 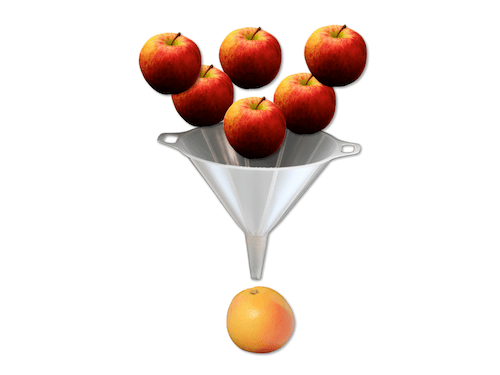 What are the ideas, processes or methods you hold dear? A blog provides a way to share a series of articles that showcase your company and what you do in a human way to which other people can relate. Reason #4: Engage in social media marketing. Chances are good that your ideal customers are using social media. You should be there too, with relevant content that interests and engages them. Are ads and product pitches going to fulfill that role? Probably not. Think about what you are likely to read or share on social media. It’s probably not advertising. But if you come across a helpful blog post, or interesting story or video, you might share it. So will your prospects. Having a blog lets you create the kind of content that you can share across all your company’s social media networks. It allows you to post relevant, updated articles that showcase your company’s expertise, or point of view, in a way that is more engaging than typical promotional content is. Reason #5. Create ongoing connections. Having a blog subscription provides a way for you to stay connected with visitors who come to your website. They may not be ready to contact you or reach out for more information about your product the first time they visit your website, but if you have a useful and relevant blog, they may be interested enough to subscribe to it. Placing a prominent blog subscription form on your website can be a way to generate new leads and stay in touch with prospects over a longer period of time in a non-intrusive way. A weekly or monthly email update from your blog will help ensure your company comes to mind when the prospect is ready to make a purchase decision. Reason #6: Encourage visitor interaction. Likewise, a website visitor may not feel they have a question or message worthy of sending an email or using your website contact form, but if you spark an interest, they may leave a comment on your blog. This gives you a unique opportunity to interact with them in a useful, unobtrusive way. Taking a few minutes each week to respond to comments will prove worth the effort as it generates a sense of interaction for your website. You shouldn’t worry too much about negative comments or spam, either, because there are a number of tools that can make dealing with both of these issues simple. Furthermore, responding to negative comments gives you an opportunity to correct misconceptions and show that your business takes customer needs seriously. Reason #7: Use content marketing effectively. On a blog, you can publish a variety of types of content, from videos, to how-to articles, to slideshows. You can offer infographics or ebooks. A blog gives you creative license to try a variety of different formats and styles of content that might not otherwise work well on a business website devoted to describing a company and products or services. A blog gives you the opportunity to show website visitors who you are, what you do, and what makes you special. That can go a long way in moving a prospect toward a purchase decision. Creating a blog on an existing website doesn’t have to be a difficult endeavor. A variety of blogging tools, such as WordPress or HubSpot, are available out of the box that can work as add-ons to your existing website and allow you to get an effective business-focused blog up and running quickly. Need help? Contact me if you need help setting up a blog, creating content, getting a website set up for your business. How mobile optimized is your website? About a year ago, Google implemented a “mobile friendly” update that promised to make mobile readiness a critical part of its site-ranking algorithm. Dubbed “mobilegeddon” by people in SEO and online marketing, it promised to have disastrous consequences for anyone who didn’t adopt mobile friendly practices, such as responsive design, by the deadline on April 21, 2015. So what happened? Did mobilegeddon, or mobilepocalyse as it was called by some, occur? Well, to some extent, yes, but it wasn’t the explosive event that was predicted for Y2K. (Do you remember that non-event?) Furthermore, many website owners say the immediate impact of mobilegeddon wasn’t felt as harshly as originally predicted. Instead, it may result in a gradual drop in rankings as Google slowly rolls through its plan to evaluate the mobile optimization of websites. Google did start providing warnings to site owners if their websites aren’t well optimized for mobile viewing. The warning only occurs in search results shown to the site owner when viewing the site on mobile screens. (How Google knows who is the site owner is a whole other discussion <wink>). However, the real message here is that having a mobile friendly website is an important element for SEO and how Google ranks your website, and it isn’t going away. What elements make a website mobile friendly? Mobile site structure. One of the most important elements of mobile optimization is making sure the site structure works well on mobile. Once upon a time this meant having specific code to support a variety of mobile phone types. However, today this typically means using responsive design for smart phones. In fact, Moz says Google prefers responsive design. The other option is to design a separate site just for mobile. For example, some parallel mobile sites use an “m” subdomain. Designing for mobile. This is a bit different than site structure and means creating pages that look good when viewed on mobile as well as desktop (for responsive sites). You’ll see this in the format of longer scrolling pages, revising what it means to be “above the fold,” and putting key elements at the top of a page (often left side for responsive grid CMS designs). Page speed. Because of bandwidth and connectivity issues, fast loading is even more important on mobile than desktop. Enhancing for speed means minimizing code, optimizing images, leveraging browser caching and reducing redirects. No Flash. One content option that still doesn’t work on mobile is Flash. If your site is built entirely in Flash (well not only is that bad for SEO in general), it’s a death sentence for mobile optimization. Local optimization. On mobile, location is important, so optimizing for local search helps improve your site’s ranking (of course, not all websites need a local search component, but for any sort of retail establishment or local service provider, it’s essential). However, including your company name, address, and phone number in your metadata will provide the correct optimization signals to Google that could very well affect your site’s overall ranking on desktop or otherwise. Follow good SEO practices. In general, optimizing for mobile takes SEO to another level and requires good use of meta tags (site descriptions), URLs, and page titles. You can include SCHEMA tags as well to help your mobile content stand out in search results (more on schema structured data here). (Originally published at UP THERE EVERYWHERE). Are you using LinkedIn to build your brand by creating content that shows your area of expertise? LinkedIn introduced the “long-form” post a little over a year ago. You can use it to post original content (blogs) that will be seen by your network. Your long-form posts should be business related. For example, you could post about trends in your industry or new technology developments. Maybe include a round-up of top articles that feature your company or product. Or post a blog from your company’s website. Just be sure to link back to your original blog post to preserve your website’s SEO. 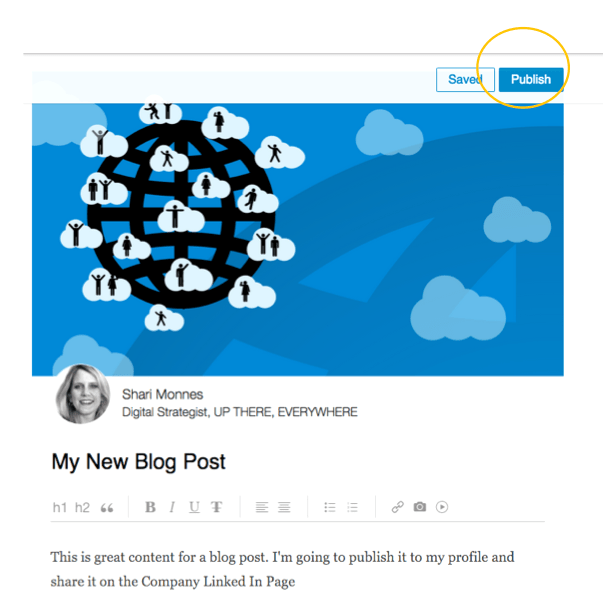 Some companies use LinkedIn long-form posts as their primary means of blogging. 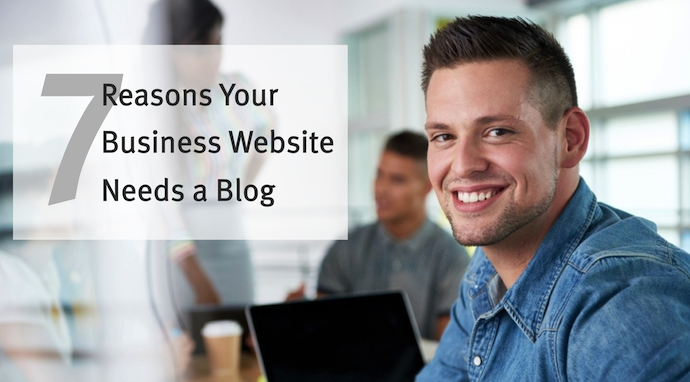 Perhaps your website isn’t currently set up to manage a blog, or your company isn’t sure about blogging? You can still develop thought leadership in your personal areas of expertise by publishing articles in this format that share valuable information with your business network. How? Create your long-form posts and then share it on your Company’s LinkedIn Page and your own profile page. (You’ll need to have admin rights to your company’s LinkedIn Page to share it there). If you don’t, ask someone who does to share your post there as an update. And be sure to use the social media sharing tools to promote it beyond LInkedIn. It’s an easy way to build your reputation. Read this presentation that shows how to do it. What motivates people to share social media content? According to a new study of global social media usage by Ispos Opening Thinking Exchange, the things which most motivate people to share content via social media are how interesting it is and humour. Probably no big shocker there. If it’s funny or unique (maybe even strange) people will share it. Still it’s interesting to note that the study of 12,420 global internet users demonstrated how the motivations for sharing content can differ slightly from country to country. Sometimes it’s more about the person wanting to portray a self image online than to be helpful to others. For example, the study showed that while the top reason for sharing content in nearly all countries surveyed was “important things,” it wasn’t the case in Saudia Arabia. There, the top reason (65%) reported for sharing something on social media was to let “others know what I believe in and who I really am.” That answer also ranked highly in Brazil, where 60% agreed. Comparatively, only 37% of the rest of the world said this was their top reason for sharing. The survey also showed some regional differences among the willingness to share “interesting” content. That reason topped the list in China, Indonesia, South Africa and Turkey, whereas it was at the bottom of the list in Japan, Germany and Saudi Arabia. 29% shared something “to support a cause, an organisation or a belief”. charity: water brings clean water to people around the world. Scott Harrison’s story of turning his life around from one of excess indulgences and shallow endeavors as a NYC night club promoter, to founding one of the fastest growing and influential non-profit charities in the world, charity: water — which brings clean water to poor villages around the world — is more than just a fascinating tale. It’s a lesson in the smart use of connections, social media, emotional selling and accountability for your actions. And it’s a striking tale of growth with a zero dollar marketing budget to raising more than $100 million dollars and helping more than 3 million people in just six years. Is it something that can apply to other industries in marketing? I think so. As a keynote speaker at last week’s Inbound Marketing Conference in Boston, Harrison presented not just a tale of how he got to where he is, but also succeeded in getting nearly 4,000 people in the room (include myself) to vow to support the charity’s efforts. Talk about leveraging the power of the masses! Read my blog post at the UP THERE, EVERYWHERE website. E3 International Agency Network will host its first-ever open conference (open to the public and not just members). For E3, this is an important moment. For international marketers, it’s a great chance to hear from some experts in the area of place branding and global marketing. 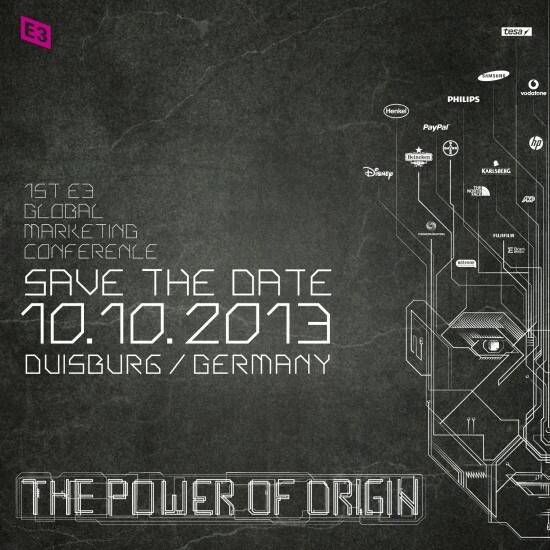 The conference will be held October 9 in Duisburg Germany. Why Duisburg? Well, for one thing, one of the agency conference organizers, Sander Werbung is there. For another, it’s a perfectly centrally located European location that many E3 members, prospects and clients will find it easy to get to. And finally, it allows E3 to turn the conference into a workshop for the city of Duisburg…bring great minds together to consider it’s branding strategy. 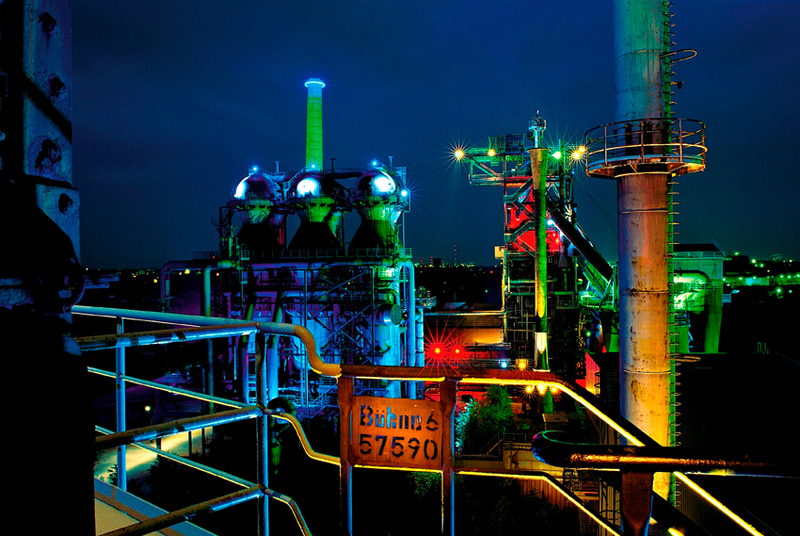 The event will be held at Landschaftspark Duisburg Nord. This former iron and steel working industrial complex has been thoughtfully turned into a community park and conference location by the city of Duisburg Nord. The E3 meeting will include several international speakers in the areas of place branding and authenticity in brand building. For more information and to register for the conference, visit the Global Marketing Conference website.